Despite my lack of excitement for zombies, the original Left 4 Dead is a lot of fun and is one of the better zombie games out there in my opinion. It’s a game about four survivors traversing through areas overrun with zombies and all you need to do is go from point A to B and shoot everything in-between. 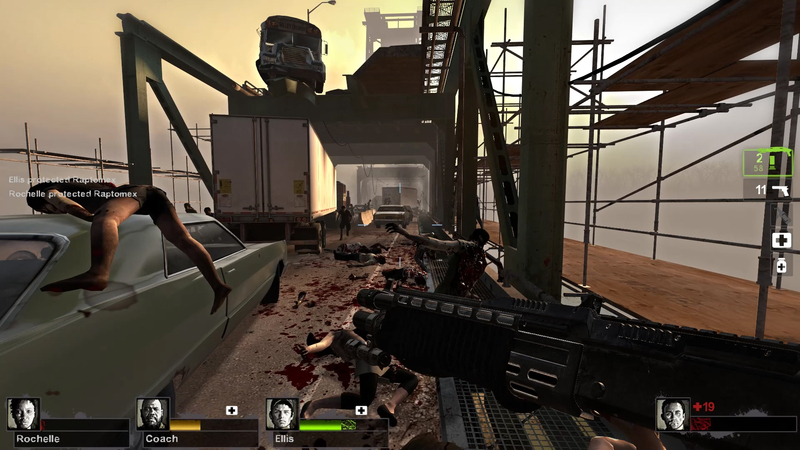 In addition to that, Left 4 Dead places a heavy emphasis on co-operative play. 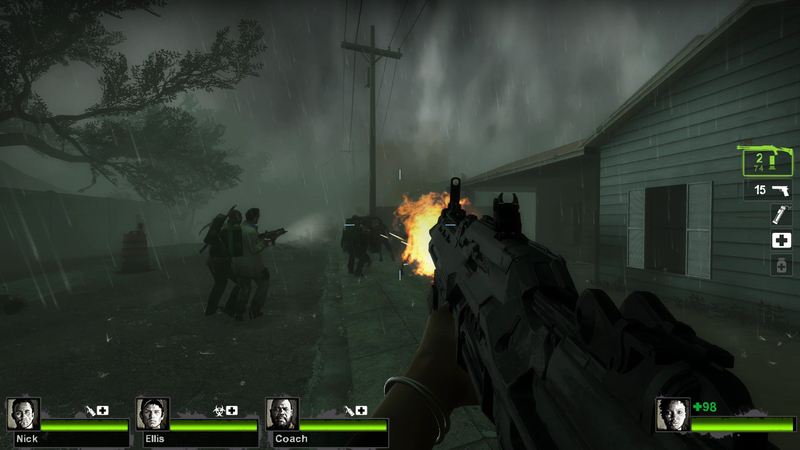 Developed and published by Valve, Left 4 Dead 2 was released for PC and Xbox 360 in November 2009, a year after the first game. For this review I played the PC version and I do have all the DLC. It includes new weapons, enemy types, campaigns, and a bunch of other new content. 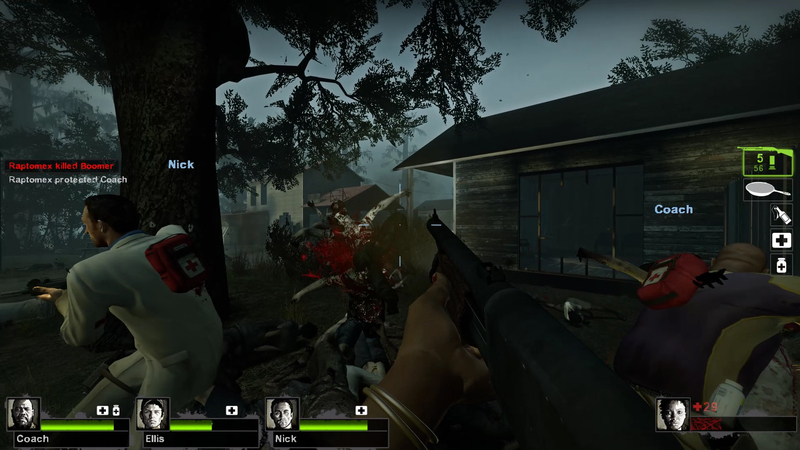 Plus, all of the campaigns from the first game were ported to Left 4 Dead 2, including the original survivors, but these campaigns do include the new weapons and enemy types introduced in this game. This game is very mod friendly and on my hunt through the Steam Workshop I went a little crazy with the subscribe button. I will be taking a look at three major mods; Improved Bots which improves the bot AI, the Counterstrike Weapon Unlocker which unlocks Counter-Strike: Source Weapons, and the Singleplayer Enabler which activates single player variants for the Mutation, Realism, and Survival modes. I installed a bunch of other mods as well, most of which are cosmetic like Improved Blood Textures, different weapon skins, Informal Skyboxes, and Cinematic Lighting Effects, among others. Before I really get into this review, I want to go over some information about installing the Improved Bots mod. First and foremost, before you do anything, read all instructions for the mod before installing. The mod found on the Steam Workshop comes with changes but if you install SourceMod and Metamod:Source, you can install various plugins for Improved Bots that can do more than a standard Steam Workshop addon. SourceMod is a platform for scripting plugins and handling server administration and Metamod:Source is a plugin environment that allows plugins to intercept calls that flow between the game and the engine. Now there’s two versions of the mod; Improved Bots (Advanced) and Improved Bots (Simple). I installed the Advanced version which does require you to edit a file. You will also need to enter a command in the launch options but I found out that you should do that after enabling the Improved Bots addon in-game. There is a link to a video on the mod’s workshop page and in the description below that goes over how to install and setup SourceMod and Metamod:Source. Follow the instructions and watch the video so you can install everything correctly. Yes, it may take you ten to fifteen minutes to get everything setup but it’s worth it for the plugins. Much like the first game, you have the option to watch a cut scene when the game first launches which is the only real form of narrative. The game plays out in campaigns with multiple chapters each. The story is set in the Southern United States, starting in Georgia and ending in Louisiana. Each chapter minus the finales has you trying to get to a safe room. Left 4 Dead 2’s story is set after the events of a worldwide pandemic of a disease known as the “Green Flu” which transforms humans into stereotypical zombies. You play as one of four survivors – Coach, Ellis, Nick, and Rochelle – all of which are immune to the disease. And, yes, you can play as the original four survivors in the original campaigns. Unfortunately, you can’t just select from any of the eight playable survivors in any campaign. They are tied to their campaigns only. Apparently the events of the story occur one week after the first game begins. 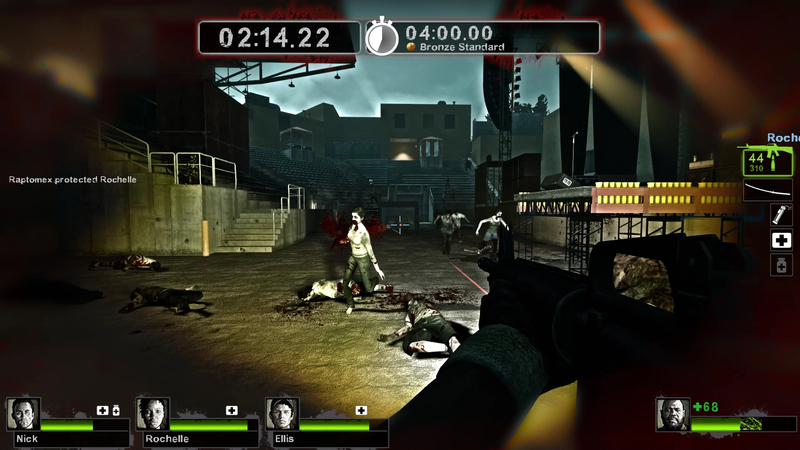 The storyline and gameplay itself are presented in a cinematic style that is reminiscent of classic zombie films and the voice acting could be better. But that could be intentional to keep in line with the game’s B-movie influence. I really don’t think anybody is playing this for the narrative but if you are, you will be sorely disappointed. There’s multiple game modes to play through including Campaign, Mutation, Realism, Realism Versus, Survival, Scavenge, and Single Player. All modes with the exception of Single Player can be played online with other people. I spent a majority of my time in the Single Player which is where you can play through all of the campaigns with AI teammates. No matter which character you decide to play as, they can all perform the same functions. You can walk, run, crouch, jump, perform a melee attack, and activate a flashlight at any time during gameplay. You can hold a sidearm or melee weapon, primary weapon, secondary weapon, healing item, secondary healing item, and a grenade-type weapon that can be thrown. If you’re low on health, walk in water, or are actively being attacked by Common Infected enemies, you’re movement is slowed down. When you get attacked, you lose health and to restore health you can use a first-aid kit. If you lose all of your health, you’ll be incapacitated, only able to fire with your pistols until you’re revived by a teammate or die. Taking pain pills provides you a temporary health boost. None of this should be new if you’ve played the first game. However, now you can acquire and use the adrenaline shot which gives you a temporary health boost, lets you run faster, and perform actions twice as fast, all for a limited time. It also allows you to run through zombies without getting slowing down. You can now equip a defibrilator which allows you to heal a dead Survivor but AI teammates cannot use this item so it’s more beneficial in multiplayer. This time around you will come across weapon upgrades but they are not permanent and only apply to the weapon you currently have equipped. You can find explosive ammo, incendiary ammo which is a lot of fun, and a laser sight which makes your weapon more accurate. Swapping your weapon out with another means you’ll lose the upgrade and the ammo types, specifically, have a limited ammo supply. Once depleted, you’ll revert back to firing standard ammo. 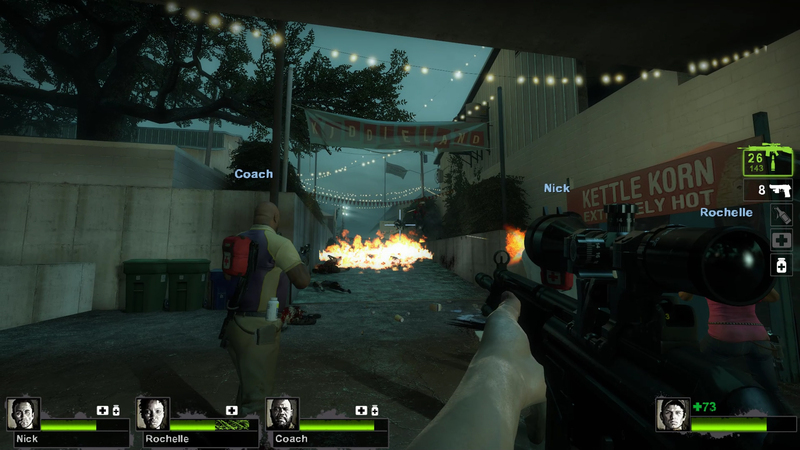 Left 4 Dead 2 has a bigger and better arsenal than the first game. There’s a lot more weapons here and some weapons are better for specific situations. This time around you have melee weapons like an axe, baseball bat, frying pan, machete, guitar, cricket bat, nightstick, golf club, and a chainsaw which does drain through fuel when used. Melee weapons are actually really good when you’re up against a horde but they will take up your secondary weapon slot so you have to choose if you want a sidearm or melee weapon. You’ll start a campaign with a P220 Pistol and if you acquire another, you’ll equip a Glock and the two can be dual wielded. The other sidearm is the Magnum Pistol and all pistols have infinite ammo. Some weapons return from the previous game but most of them are new. The pump shotgun returns and then there’s the chrome shotgun which is more accurate. In addition to the submachine gun, you can now equip a silenced submachine gun which has greater stopping power. What was known as the auto shotgun in the first game is now known as the tactical shotgun but you may want to swap it out for a combat shotgun if you come across one since it’s more accurate. You can equip two sniper rifles, one of which is the hunting rifle and the other is actually called a sniper rifle. Then there’s the assault rifles. You’ve got an M-16, AK-47, and combat rifle which fires in bursts. Finally, there’s the two special weapons which are extremely deadly but they’re not found often and their ammo cannot be re-supplied by ammo piles. These include the grenade launcher and M60. You can, of course, carry one grenade-type weapon. The pipe bomb and molotov make a return with the former being very useful if you need to divert enemies away from you. After being thrown, the pipe bomb beeps, attracting enemies, and then explodes which can result in a large mob of zombies being blown to hell. The Bile Bomb is a new grenade-type introduced here and contains Boomer bile. When thrown, it explodes upon impact whether it be on a surface or enemy and attracts other enemies. You can even cause enemies to fight each other with this thing. It’s pretty cool. Now I should mention that the German version of the game is censored in some way so Valve decided to port some weapons from Counter-Strike: Source into that version, specifically. However, I believe these are technically in all versions, just not available for use in the vanilla game, or maybe people modded them in but whatever the case, thanks to the wonderful modding community, I discovered the Counterstrike Weapon Unlocker which adds these weapons into the existing arsenal. These include an MP5, SIG SG552, the Scout and AWSM sniper rifles, and the mod also lists a combat knife which I never actually came across or maybe I just missed it. The guns do fit in well with the existing arsenal even if they are ripped directly from another game. In addition to all of the weapons you can actually equip are what I’ll call the fixed weapons which include the minigun and heavy machinegun. You’ll also get the chance to use environmental weapons. You’ll come across gas cans, oxygen tanks, and propane tanks, all of which can be picked up, thrown and shot to explode and/or set fires. You can also pick up and throw a box of fireworks in one chapter which, when shot, releases exploding firecrackers that light the area on fire. You can also shoot exploding barrels. Utilizing these environmental weapons can be a life saver like setting a fire for a horde of infected to run through which will not only kill enemies but also save you ammo. All of the enemies from the previous game make a return. The Common Infected are the most common enemy types you’ll encounter. Once again they normally just stand around, they’ll walk around slowly, they’ll climb over obstacles, and they’ll come running at you if they spot you. And they are attracted to noise like car alarms which when set off, cause a horde of common infected to come for your entire group. These are your stereotypical zombies and it doesn’t take much to actually kill one. This enemy is basically harmless by itself but they’re more dangerous in large numbers like hordes. Hordes usually appear at certain times or when you activate something, they can break through doors, and they’ll come from multiple directions. There are new variations of the Common Infected known as Uncommon Infected which only means they don’t appear as often but they do have special traits. These include a fireproof type wearing a hazmat suit and there’s a chance these guys may be carrying bile bombs which they will drop when killed. The mud men are somewhat camouflaged in mud. Clowns make noise to attract other infected. The fallen survivor infected carries items that it will drop when killed. And the riot infected which are armored with their backs being the most vulnerable spot to shoot. The special types like the Boomer, Witch, Smoker, Tank, and Hunter all return. The Boomer can spit bile on you which will attract enemies, the Smoker can constrict you with its tongue and unleashes a cloud of smoke when killed that can obstruct your view, and the Hunter is fast and will pin you down before slashing away at you. The Tank is still the largest and most deadly enemy in the game and you may even consider it a boss-type enemy. It’ll throw concrete slabs, it can punch vehicles out of the way, and basically beat you to death very quickly if you’re not quick to take it down. Now the Witch retains its behavior but she will now walk around when in daylight. Furthermore, I know the enemy placement is basically randomized but in my experience, most of the time I encountered a Witch, she was always placed right where I need to go. And I mean in a spot where there’s real way around. You can’t be too close to her for long, shine your flashlight on her, or shoot her, or she’ll attack you which usually incapacitates you instantly. But I found her placements here to be more of a nuisance. Also, normally she appears maybe a few times per campaign, usually only once per chapter if at all, but in the Sugar Mill chapter, she appears numerous times. I wanted to know why and I’ve read it’s because she’s attracted to sugar. Left 4 Dead 2 introduces several new Special infected enemies into the mix including Chargers which come charging at your group and can impale survivors into walls or the ground before proceeding to beat them to death. However, these guys look more threatening than they actually are because they can be killed rather easily. The Jockey is a lot like the hunter except this thing will ride on your head and drain your health. Spitters will spit acid which results in a pool of acid on the ground that will drain your health rapidly if you’re standing in it. Because of these new special infected types, Left 4 Dead 2 does feel a bit more challenging than the first game. These new enemy types will populate the original campaign environments as well. You’ll always be accompanied by AI teammates in single player and for the most part, they behave intelligently in the vanilla game. It’s always wise for everyone to stay close together so you can easily be rescued, revived, healed, or to give each other healing items. They will grab and equip firearms but never melee weapons or any of the grenade-types. The AI will shoot at and kill enemies, including the Special enemy types, they’ll heal you if you’re low on health, revive you if you’re incapacitated, and even help each other out. If an AI teammate dies, they will respawn later on in a closet of sorts and all you need to do is get to them for them to rejoin the group. My biggest complaint with them is that they will often get in your way resulting in friendly fire. Most of the time, they’ll stick by you but every now and then one AI survivor would somehow get separated from the group and get stuck somewhere way back in the environment and it just wasn’t worth it to go back for them. There was also a couple of scenarios where I was constricted by a Smoker and a nearby Survivor did nothing as I was constricted to death. Left 4 Dead 2 is clearly designed to be played with others and I’m aware there’s only so much the bots can do but compared to other games that team you up with AI characters, their behavior here could be a lot worse. The Improved Bots mod does exactly what it sets out to do. It makes the friendly AI more intelligent, although the mod does have some quirks. For one thing, it changes the Single Player menu in a way that you can’t select the chapter, character, or difficulty before starting a game. You can do it during gameplay through the mod’s radial menu but I don’t understand why it doesn’t let you choose these options beforehand. You can get around it by starting a Campaign game from a Local Server. The plugins are definitely worth it and they can really enhance the single player experience. Defib using Bots allows bots to use defibrillators to revive you. Gear Transfer allows them to pick up throwable items and hand them to you. ScavengeBots allows them to pick up gas cans required for finale events in specific chapters. And Survivor Bot Takeover allows you to automatically take control of a bot when you die. The only one I didn’t install is AutoHelp which lets you help yourself up when incapacitated. I would recommend reading the instructions on how to use these plugins because some of them require you to do something beforehand like entering commands for example. With the mod installed the bots will equip and use melee weapons, they’ll do their best to not shoot through you anymore, they seem to stick closer to the player, and they heal you much more often. They will pick up grenade-type weapons, defibrillators, and weapon upgrades. However, they won’t throw any grenade-type weapons and whenever you don’t have an item, they tend to just give you whatever they’re holding. This isn’t necessarily a bad thing since they basically double as item storage now. They’ll still heal themselves and now they can actually close safe room doors once everybody is inside which is nice. The mod comes with a radial menu that allows you to do different things, including activate bot commands but I believe these commands do disable achievements. You can now take control of bots and teleport bots back to you if they get lost or stuck. There’s also commands to change the difficulty and map at any time during gameplay. The bots seem to have better reaction times and do a better job at defending you and I think my only issue is with them grabbing the gas cans in the specific finale chapters which I guess is related to the ScavengeBots plugin. They do grab the gas cans but seem to just throw them anywhere and it also causes them to split up more often which in turn means they usually get attacked and incapacitated more often. It would be nice if they could complete objectives but it is what it is. The mod’s Steam Workshop page clearly indicates the creator can only do so much and the bots still aren’t perfect but if you enjoy the single player portion of the game, I would absolutely recommend the Improved Bots mod. I thought one of the coolest things about the first game was the AI Director and I’m happy to say The Director returns here. The Director is the artificial intelligence of the games and determines what enemies spawn, their placement, as well as what items and weapons spawn and where. This is all based on your current situation, status, skill, and location. But in Left 4 Dead 2, it goes a step further. Dynamic maps are implemented which means the map layouts will change depending on how well the Survivors are doing. Paths may be tweaked, a different car may have an alarm active the next time you play through a map, weather effects like rain storms will occur randomly in one map, and other little tweaks that you may only notice during multiple playthroughs. The AI Director is what makes each playthrough unique and it gives this and even the first game infinite replay value. There’s another Director which controls music which I guess means it determines when the music will play. 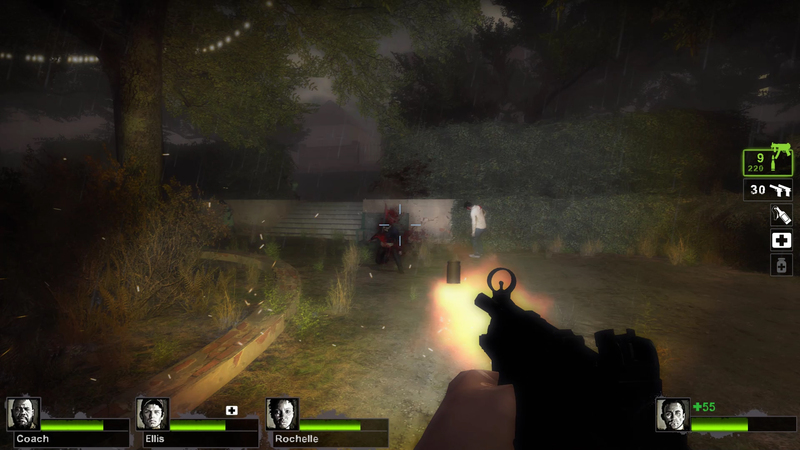 There’s a total of seven campaigns in Left 4 Dead 2 which do not include those from the first game – Dead Center, The Passing, Dark Carnival, Swamp Fever, Hard Rain, The Parish, and Cold Stream. The Passing and Cold Stream were originally DLC campaigns and Cold Stream in particular was developed with assistance from the fan community. Most of the environments feel a bit more open than those seen in the first game, giving you more freedom to navigate from one area to the next and where you need to go is pretty straightforward. There are rooms and areas off the beaten path and you’ll want to explore these for resources. You’ll traverse through farms, cornfields, houses, swamps, apartments, and mostly areas set in the countryside. My least favorite campaign is easily Hard Rain. It’s a unique campaign due to the rain storms you’ll have to navigate through and the fact that you’ll have to backtrack through environments in two of the chapters, but you’ll also have to traverse through a lot of water which slows you down, it contains the Sugar Mill chapter that has more Witches than any other, and I felt like I was a moving at a slower pace compared to most other chapters. Swamp Fever is another campaign I’m not a huge fan of but only because of all the water that slows you down. I did really enjoy The Parish campaign, it’s probably my favorite, and it ends with a gauntlet on a bridge. It’s just non-stop action. Most chapters have you navigating from one safe room to another. Safe Rooms are areas where you’re completely safe from harm and can resupply ammo and health items. There are no checkpoints so if you all die, you’ll have to restart the entire chapter. Some chapters require you to complete specific objectives, especially the final chapters of each campaign. You’ll have to find and deliver cola to a gun store owner, fill up a car and generator with gas, shut things down, open a gate, and even start a rock concert. Whenever you activate something, a horde or multiple hordes of enemies are thrown at you and this time around, you may have to run through gauntlets of enemies. This means they won’t stop coming. These are usually at the end of chapters and you just need to run through the gauntlet to get to your destination. Sometimes you just need to wait for something to happen and survive in the process. At the end of chapters you’re ranked for various feats like how many infected killed, how much damage done to the Witch and/or Tank, how many special infected killed, and others. When you finish a campaign, the credits roll which fits with the whole cinematic style the game is going for but the credits will display your team’s stats for that specific campaign. There’s four difficulty modes to choose from – Easy, Normal, Advanced, and Expert. Then there’s Realism. While it’s not technically a difficulty mode, is does make things more challenging and is designed for those who frequently play together online. Realism is a variant for the Versus and the Campaigns and can be applied to any difficulty mode. 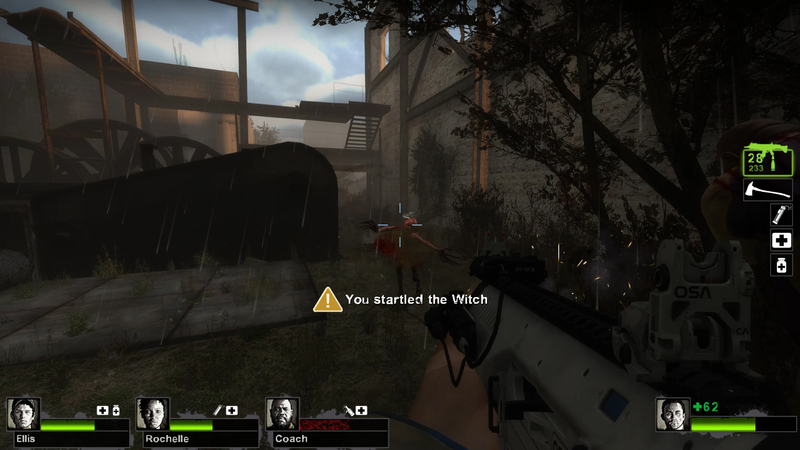 With Realism active, enemies take less damage to the body so you’ll want to aim for the head, Witches can instantly kill any survivor they hit on any difficulty except Easy, characters or players can only respawn in safe rooms after death, and the outlines that surround teammates, weapons, and items so they’re easily identifiable, are removed. Sticking together is extremely important here. If you’re looking for a more challenging experience, Realism may be perfect for you. And while Realism is designed for co-op specifically, there is a mod on the Steam workshop called Singleplayer Enabler that activates a single player variant for Realism in addition to the Mutation and Survival modes. If you’re hellbent on playing solo you could just start a friends-only online session in these modes and you’ll be accompanied by AI teammates until players join in assuming you don’t have friends who play this often. If you do, Singleplayer Enabler should suffice. Mutations are like gameplay modifiers that can be applied to different game modes. The Singleplayer Enabler allows for any mutation to be activated for single player. All of the mutations that come with the game are created by Valve but you can download more which are created by other players. The mutations will change up the gameplay in various ways. For example, the Four Swordsmen mutation equips players with only katanas and they are pitted against Special Infected. The Gib Fest mutation provides survivors with M60’s that contain infinite ammo and a Magnum. This mutation in particular makes you feel like Rambo in a zombie apocalypse. The Last Man on Earth and Lone Gunman mutations are interesting. These two are actually designed for one player and these can actually be played without creating an online session in the vanilla game. Last Man on Earth removes the survivor bots and common infected, forcing you to contend with only the Special Infected enemy types by yourself. This one is actually pretty hard. You won’t get incapacitated so if you get pinned or constricted, you’ll live through it but will immediately need health. If you get knocked down before acquiring health, you’re dead. Basically, you need to be really careful at all times because you have no support. Lone Gunman provides you only the Magnum and pits you against the common infected and Boomers. 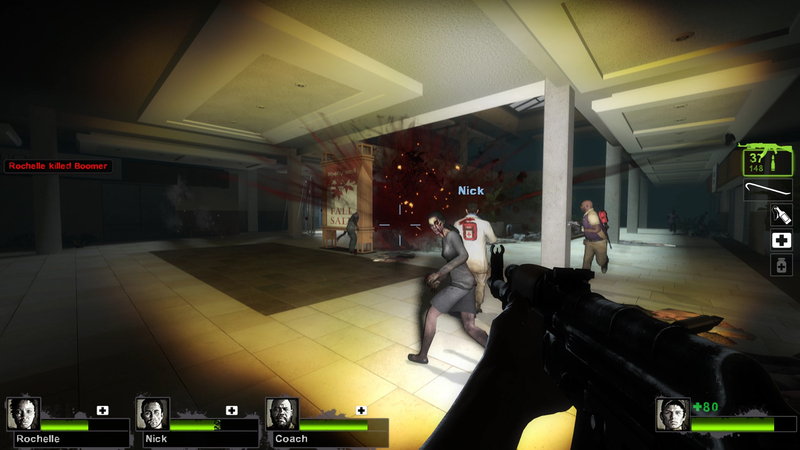 The L4D Co-Op mutation is neat because it makes it so only the weapons, enemies, and items from the first game spawn. Now there’s all kinds of mutations you can play with and you can install user-created ones through the Steam Workshop. Mutations basically allow you to make the game harder, easier, or just modify the gameplay to your liking. I did not attempt the Versus or the new Scavenge mode, both of which are competitive gameplay modes. However, I did try the Survival mode and it’s basically unchanged from the first game. You start in a map with various weapons, health items, and weapon upgrades to choose from. Once you’re done preparing, you proceed to activate something which actually activates the hordes. Hordes of infected come rushing towards your group and you just need to survive for as long as you can. The hordes never stop coming and you can earn medals for staying alive for certain amounts of time. The Survival match ends when you all die. Survival is probably best enjoyed with multiple players because just like the first game, the vanilla bot AI cannot seem to stay alive very long, usually only a few minutes. The Special Infected always seem to get the better of them. Each campaign only has a few maps available and they are technically unique for this mode even though they’re all locations ripped from areas seen in the campaigns. For some reason, the Last Stand survival campaign which was unique to the Survival mode in the previous game, was not ported over. Visually, Left 4 Dead 2 is better looking than its predecessor. I did see some pop-in here and there, especially when navigating the outdoor areas but it doesn’t bring down the visual presentation in any significant way. The weapon models look great and contain plenty of detail and I love the reload animations. The lighting is excellent and I would often turn off my flashlight to see the gunfire illuminate dark areas, especially when everyone was firing at once. It looks really cool. The Cinematic Lighting Effects mod adds more realistic glows, a new sun glare, horizontal flare to pathway lights as the mod description puts it, and these little changes do look pretty good if you take the time to actually look. The new glares and pathway lights are the most noticeable. And this mod is compatible with Informal Skyboxes which replaces the skyboxes with much better looking ones. You can still tell the game looks a bit dated but the textures still hold up and the animations really make the gunplay feel satisfying. It’s the way enemies react to gunfire when shot. It’s awesome watching the infected run and then take a few bullets before stumbling and falling to the ground. You can shoot off their heads and limbs, body parts will fly up into the air due to an explosion, blood will fly out of infected bodies when they take a hit, and you can even see their torn flesh and guts pouring out from major wounds. The Improved Blood Textures mod adds higher resolution blood textures which enhances the gunplay even more and blood will literally spray everywhere. Entire rooms can just be covered in blood. It’s all of these little things in combination with the animations that make shooting every Common Infected enemy an addictive experience. And the sound effects really drive home the satisfaction of firing your weapons. The weapons fire is loud, minus the silenced submachine gun, and the sounds of any sniper weapons fire will echo with each shot. The enemies make typical zombie noises. You’ll hear them roaring, growling, screeching, and making disgusting bodily noises. Music only seems to kick in at certain points and ramps up when you encounter a horde or tough enemy types. The soundtrack contains a lot of creepy and intense tunes and beats that fit the action and zombie theme well but I can’t say any of it is really memorable, at least to me. Throughout some of the environments are jukeboxes that will play music. There’s some rock songs and I think I heard a jazz tune. When I found the AC/DC JukeBox Music mod on the Steam Workshop, I installed it immediately. It does exactly what it sounds like, it replaces all the jukebox songs with AC/DC songs. Unfortunately, you need to be near the jukebox to hear the music so you really can’t run and gun too far while still being able to listen to Highway to Hell. As for the technical aspects, the vanilla game ran fine but with all the mods installed, I noticed some hitches and stutters here and there. Now I did encounter some bugs. At one point, for some reason enemies and their blood were in black and white. It was very odd. I just restarted the game and never encountered it again. Part of the SIG is cut off which was resolved after installing a new weapon skin. And, finally, I did notice some clipping. 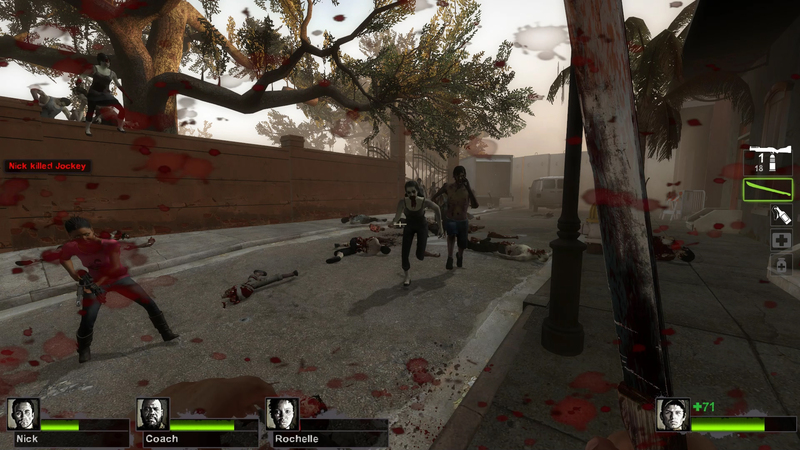 I had a great time with Left 4 Dead 2 and it basically renders the first game obsolete. In fact, it contains almost everything in that game and more. Ever since the Left 4 Dead campaigns were ported to Left 4 Dead 2, I see no reason as to why I would ever play the first game again. You can experience those campaigns here in all their glory with all of the new weapons and enemies. I think the bigger and better arsenal and the improved AI Director are really what make this game as much fun as it is. Even though it’s designed with co-op in mind, this is a perfectly competent single player shooter and if you have the Steam version, there’s all kinds of mods available. I will say the gameplay is basically unchanged from the first game, you just have more gameplay modes, weapons, and enemies here. It’s still about moving from A to B and shooting everything in-between. There’s not a lot of variation when it comes to gameplay. Thanks to the AI Director, each playthrough will be a unique experience in terms of what things spawn and where and possible alterations to parts of the environments but it doesn’t change the fact that you’ll still be doing the same exact thing every time you play. Shooting zombies and trying not to die. If the gunplay and shooting enemies wasn’t as fun and satisfying as it already is then the repetitive gameplay would probably be a bigger problem. 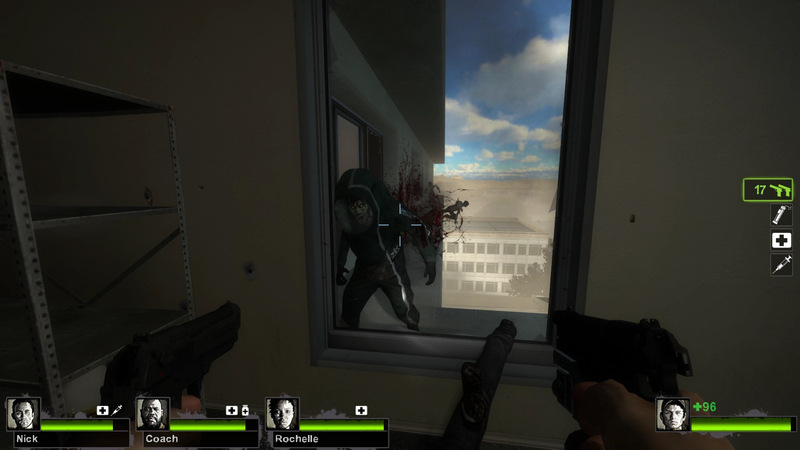 I would definitely recommend Left 4 Dead 2 to fans of anything zombies, shooters, and action games. I’m not a fan of zombies in general but the Left 4 Dead games are probably my favorite zombie games of all time. At least as of this review. This series is all about running and gunning and blowing away hordes of infected. You can enjoy it in short bursts or long sessions and Left 4 Dead 2 takes everything that was great about the first game and just improves it. And the fact that the first game’s campaigns were ported over means there’s virtually no reason to even play the first game unless you don’t care for any of the changes or additions here. But even still, those campaigns come with the game now so it’s just an added bonus and this is basically two games in one. 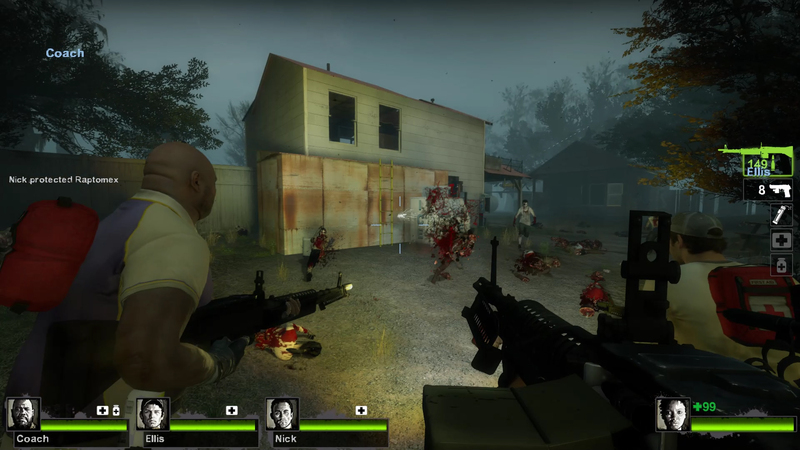 If shooting zombies is your kind of thing, definitely check out Left 4 Dead 2.